More than 30 percent of LinkedIn members who view jobs posted on the site access LinkedIn from mobile devices. And previously, users were only able to save jobs on their mobile devices, but not apply. Yet, the popular social network recently changed all that. 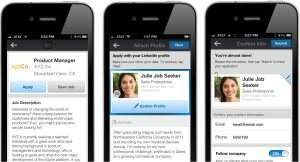 LinkedIn, the world’s largest professional network, just introduced a new capability allowing users to apply for jobs anywhere and on any device using the new iOS and Android apps, or the mobile web version of LinkedIn. This new ability is designed to make it easier for mobile users to provide recruiters with their professional information as members apply for job openings using their LinkedIn profiles. The new “Apply” button allows members to apply for jobs, if the job poster collects applications in LinkedIn Recruiter. If the job poster receives applications through an ATS system, users will have a button option, “Apply on Company Website,” and apply outside of LinkedIn. 1. Start the application: Members start by clicking the “Apply” button. 2. Apply with profile: Users will then be prompted to apply with their LinkedIn profiles. If necessary, users can update their profiles during this point. 3. Confirm contact information and submit: Users confirm their emails and phone numbers, click “Submit” and receive a pop-up confirmation. Applications submitted via the “Apply” button will be saved within LinkedIn Recruiter. And the best part? The entire process takes less than one minute to complete.